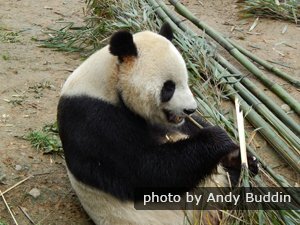 Tianshui Travel Guide: history, eating, sleeping, photos and travel tips. The city of Tianshui is located in the northeastern part of Gansu province. It is the second largest city in the province, and it is about 338 kilometers from Lanzhou City, Gansu&apos;s capital. Car travel to Lanzhou takes about 4 hours. Tianshui is on both the Yangtze River basin and the Yellow River basin, and it is on the "Eurasian Continental Bridge," a rail route said to be the cheapest and fastest land route between China&apos;s Pacific Ocean coast and northwestern Europe. Under its jurisdiction are five counties: Zhangchuan, Qin&apos;an, Gangu, Wushan, and Qingshui. It also has jurisdiction over the Qinzhou and Maiji districts. It has a total area of 14,300 square kilometers, and a population of approximately 3 million. About 300,000 people live in the Tianshui urban area. Established during the time of Emperor Wu Di, Tianshui County has had a 2000 year history. Tianshui is a famous historic and cultural city. It is on the route of the ancient Silk Road. The city was named by the legend of the "Tianhe River Infusion." In myths, Tianshui was the birthplace of Fuxi, the earliest Chinese ancestor. The Dadiwan society existed here during the Neolithic times. Then, the Qin state, later to become the founding dynasty of the Chinese empire, conquered other territory from Tianshui. The Qin established the first empire of China that lasted from 221 to 206 BC. The famous Terracotta Army statues in Xian and the first part of the Great Wall of China was built by this dynasty. 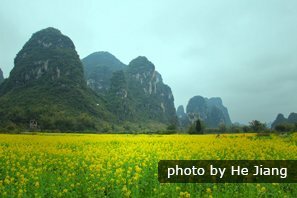 The land was originally bestowed by Xiao Wang of the Zhou Dynasty to Feizi whose surname was called "Yin." Feizi described ideas on law and justice that were adopted by the Qin rulers. Tianshui is renowned for its historic relics and natural beauty. Fuxi Temple and Guatai Mountain are places where Chinese people worship their ancestors. Water Curtain Cave in Wushan Mountain has a lot of ancient towers, sculptures, and portraits. Daxiangshan Mountain in Gangu county is majestic and magisterial. On the hill sits the giant Buddha. The Immortal Cliff is near Maijishan Mountain. Here is a unique tourist attraction that integrates three religions: Confucianism, Buddhism and Taoism. 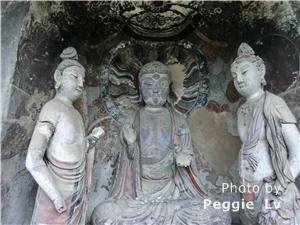 The Maijishan Grottoes are filled with thousands of exquisite clay artifacts in grottoes. This is reputed to be one of China&apos;s Four Greatest Grottoes, along with the Dunhuang Mogao Grottoes, the Longmen Grottoes, and the Yungang Grottoes . Noodles are the most famous snack foods in Tianshui. 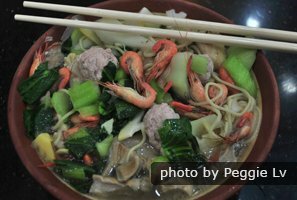 There is a range of styles like GuaGua, Liang Pi, Liang Feng, Jangshui, Sweet Grains, Islamic noodles, noodles with sauce, and Jaotuan. Pedestrian Street and places near the Commercial Building in Qinzhou District are the most prosperous in Tianshui. Tianshui Arrow Field is actually a fair trade market. It is located next to the Pedestrian Street. The delicious foods there are mainly snacks that include virtually every variety of snack in Tianshui and delicious ones from other regions. The price is never high. If you want to taste different delicacies, it is definitely a good choice. Tianshui city has a temperate continental climate. It is kind of humid, has well-marked seasons, and mild summers and winters. 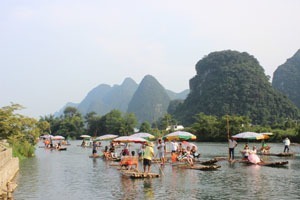 It has splendid landscape, and a nickname: "South of the Yangtze River." The annual average temperature is 11.5 ℃. The hottest temperature is 33.4 ℃ in July, and the coldest month is January. Tianshui receives an average annual rainfall of about 574 mm. 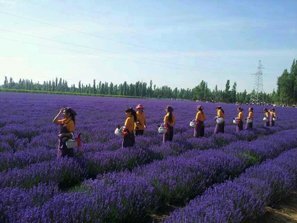 The best season for travel in Tianshui is from September to November every year.